The island nation of Japan has undergone some tumultuous times in recent years, the environmental catastrophe brought on by the 2011 tsunami disaster led to a feeling of great unease in the international snow industry… This disaster brought about a damaging decline in tourism to the tune of ~ 30% on previous years. Throughout these times of challenge and uncertainty the famously named ‘Ja-Pow’ is one product that the Japanese know how to deliver and deliver is exactly what they do. Anyone who has been lucky enough to experience a trip to Japan will know that the quality of snow is like nowhere else, cold smoke would be the best way to describe it and if your lucky you will be able to get a breath of oxygen in between face shots! 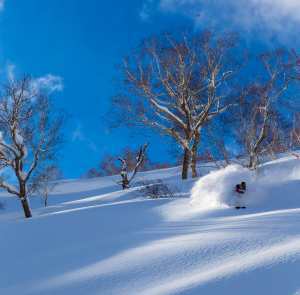 Recently, things are looking up for the land of the long deep snowfall, industry leading tour operator SkiJapan.com has been leading the road to recovery and is reporting a growth in bookings not seen since SkiJapan.com commenced sending people there. 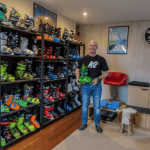 This is likely due to a number of external factors such as the strength of the $AUD, flight specials on offer from discount carriers plus the natural organic growth of a snow destination like Japan. At the end of the day one thing is certain, if you haven’t been to Japan then you’re missing out, while it is still to early to tell how the season will likely pan out, two things are certain, the snow will fall, and it will be deep! Imaginary Flying Machines By Tess Cook, Photos By Joey Corcoron…. 10 days in Japan with those gentlemen of snow Chris Booth and Joey Corcoran to find out what it is about Niseko that earned it such a revered place in the Australian snow consciousness and to decide for ourselves why it should earn a place in our own personal snow psyche. As the old adage goes – a picture tells a thousand words and so I hand over to the impressive talents of Mr Joey Corcoran. Enjoy…. 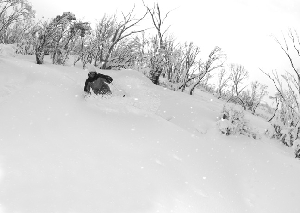 It would be impossible to capture the effervescent quality of Niseko’s powder in an image. I don’t think it’s really possible to describe it either, but I’ll try – starting with a helpful term from Joey Corcoran: ‘Superman snow’, because, obviously, it makes you feel like a superhero. It’s oh-so-dry and beautifully yielding. It took me a little while to adjust to how acquiescent it is, every bump I steadied myself to absorb just parted beneath me like butter under a hot knife. 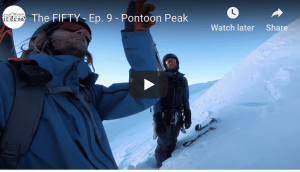 Truly weightless powder skiing is a rare experience; you need buckets of really dry snow – buckets, really dry. It’s that ‘am I flying?’ sensation. When every turn is an effortless, floating extension of the one before and you almost feel like you’re travelling in slow motion. We’re all endlessly chasing that feeling, and in Niseko you can have it virtually every day. How can I put this? The food may be more of an incentive to visit than the snow. From our first late night supper at Abucha in downtown Niseko – the most incredible salmon I’ve ever tasted – to the Okonomiyaki at Cocoro – so good we ordered our whole dinner over again – every single meal was a memorable food moment. I thought I’d be spending the week eating fresh fish in small portions and generally embracing the ‘why Japanese women don’t get fat’ lifestyle – NOPE. Hokkaido is Japan’s food basket and the amazing produce is put to good use in the region’s kitchens. People fly from Tokyo just to eat at places like Rakuichi, where the handmade soba noodles are cooked in local volcanic water. Special mention here needs to go to J-Sekka cafe; purveyor of delicious western-style breakfasts and coffees. Japanese cuisine is hands down my favourite but I can’t quite manage raw fish at 8am, so thank you for the yoghurts and innovative chocolate muesli. And that, my friends, is Niseko – where mind-ski perfection becomes reality. Even the trees are free from branches and perfectly spaced so you can bound through them with the finesse of Sean Pettit in The Way I See it – or at least it feels like you are, and isn’t that what matters? Feeling amazing? Niseko skiing makes you feel amazing. So haters, there mightn’t be any monster-mountains, ready to swallow you up al la Chamonix but Niseko isn’t flat, it’s just right. Almost all travel is about experiencing new things and different cultures and that can sometimes be sidelined on ski trips, when the focus is on riding all day, every day. In Niseko, culture is everywhere. In just a week we learned to make sushi – a very practical skill I’ve been putting to good use since – took part in a Japanese tea ceremony, dressed in kimonos, soaked up the tradition – literally – at the onsens and entered the world of taiko drumming with the Yotei Daiko troupe (if you’re unfamiliar with taiko drumming- Google it, get excited). We saw an incredible performance and had the chance to play ourselves. In other words, we packed our week with cultural activities and because Niseko’s lifts run until 8pm every night so you can easily take the afternoon off to make sushi or create a Japanese ink drawing without sacrificing snow-time. 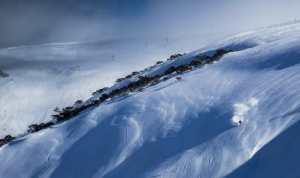 Of all the northern hemisphere ski-places, Japan is the easiest to get to. It’s eight or so hours from Sydney to Tokyo, where Japanese efficiency has you turned around and on your plane to Sapporo in amazing time – unless you want a Tokyo stopover, which is well worth it. The two hour time difference means no jet lag – unless you count rising early the first couple of mornings, and that’s not a bad thing. A HUGE shout out to SkiJapan.com – who where the ULTIMATE hosts. Seriously the first to check out if you’re heading to Niseko.